Domagoj Duvnjak, behind him Pero Metličić. SPAIN: Hombrados, Entrerrios 4, Ugalde 1, Rocas 3, Canellas, Garabaya 1, Andreu 3, Viran 2, Perales 2, Barrufet, Juan Garcia, Romero 5, Ruesga 1 and Tomas. CROATIA: Losert, Hrvatin 1, Balic 3, Duvnjak 7, Lackovic 6, Zrnic 1, Vori 5, Gojun, Spoljaric, Metlicic 3, Buntic, T. Valcic 1, Alilovic and Cupic 5. The host of the World Championship has convincingly defeated Spain and ensured the entry into the second round. The match Croatians played yesterday proved their qualification for the highest position. 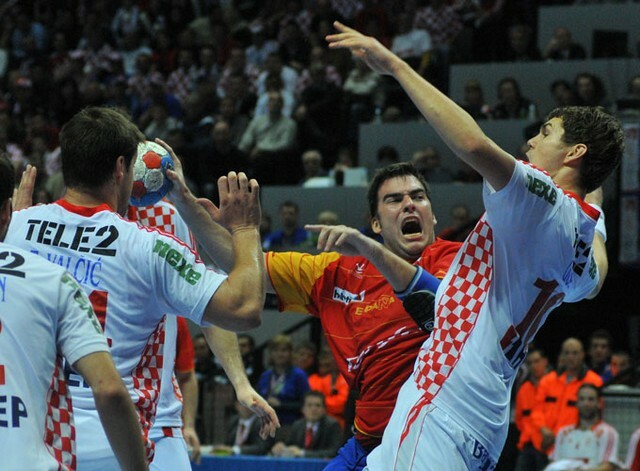 It was also a revenge of Croatian handball team for the defeat they suffered from Spain in the match for the third place at the Olympics in Beijing. In a great atmosphere of Spaladium Arena Croatian players showed determination from the very beginning, with the help from supporters. Spaniards, in defending line 3-2-1, tried very hard to find their way to Alilovic and his goal. Their attack was quite precise from the very beginning. Rivera noted already in the 12th minute, that his team wasn't "set up". After the leadership of Croatia 7:2 and the 7-meter goal by Cupic, Spanish selector asked for the time-out. In the match Rivera imposed Peralesa and Romero to play. The balance was established only for a few minutes, but just to reduce the lead of Croatia (8:5). The second part of the first half-time was Croatian game Rhapsody. The back line players gave their best, Blazenko Lackovic had his greatest moments at the World Championship, Domagoj Duvnjak was also inspired, and they were all followed by Peter Metlicic, who thanks to his goal made Croatia led in the 25th minute with eight goals difference (17:9). The stands were „hot“ in the 27th minute, when Duvnjak was excluded. Due to the complaint two minutes were indicated even to the Croatian selector Lino Cervar. Croatian team almost had to defend themselves without two players on the field. At the end of the penalty Entrerrios scored a goal for Spain and that was the last one in the first half-time. In the resumption Spanish started with defense 6-0. It only helped them to reduce the delay in the 40th minute (20:15). Offensive with two consecutive strokes was Balic and Croatia once again took back the advantage that it had at the beginning of the second half-time. The last ten minutes passed without the result’s uncertainty, two minutes before the end of the match Lackovic was brought to Croatia the lead of ten goals differences. With such a difference Croatia ended the match in its favor, which was celebrated loudly at the grandstands, but also at the court. - I would like to thank the whole team because they played smart, with full concentration, but also with a heart. I praise the great atmosphere and with these fans it is difficult to lose. But it will be inappropriate if I thought that is all over. The plan is still to go to Zagreb with four points. - This defeat is humility for us. We have simply disappeared from the court. Croatia has played very well and for us it remains to justify the reputation to our supporters. Ivano Balić, born in Split, playing in his native city as a representative of Croatia. He is among the best handball players of today. The Croatian selector Lino Cervar decreased the intensity of trainings right after the last friendly match against Slovenia. The team is now mostly practicing and preparing technically and tactically for the first match on the World Championship, against Korea. Everyone says the atmosphere in Split is great, and that proved the mutual fun between players and fans. Ivano Balic, Igor Vori, Blazenko Lackovic and the ex-representative, but still very famous, Vlado Sola, gave autographs and talked with many curious inhabitants of Split. It was also discussed during one of the last press conference before the beginning of the World Championship, which held the assistant coach Slavko Goluza, the team captain Pero Metlicic and one of the youngest players, but already skilled, Ivan Cupic. The first one to speak was the oldest one, Goluza. - As usually, this time we also set high objectives. We are aware we have to play match after match, it's the only way to attain the objective. We want to emphasize once more that the atmosphere before the first match against Korea is outstanding and I'm sure, we won't repeat the same situation like one on the European Championship 2000, when we made mistake on our home field. For the team captain, Petar Metlicic, the last year was a hard one with many injuries, however he said, that's the past now. - Finally I feel great. I don't have any problems; I’m healthy and very motivated for everything the fans except from us. I practiced in Spain in my club and also with a young coach Zeljko Babic. The trainings helped me a lot and I'm now in a very good shape, said the team captain. The first opponent is Korea. - We are aware how important that match is. Korea is unpredictable and can win any national team. They also expect to pass the 2. Round and they'll be very motivated. I don't doubt our victory, since we want to pass 4 point to the next round. If we succeed, nobody will stop us, said optimistically Metlicic. Pero Metlicic told a few word about the friendly match against Slovenia, and announced the matches against others national teams in our group. - Regarding Sweden, my team mate from Real Kallman told me they play very fast and have short attacks. They are young and very ambitious, as the Spaniards, which also have younger players after Beijing. I think their strongest surprise is the new selector Rivera, a cunning old fox, who won a lot during his career. - I believe the selector will choose the best ones and they'll be very good. I'm sure we'll play as a strong team, without individuals. I'm very happy be in a team I recently watched on the TV - concluded Cupic. Spain has one of the best handball teams in the world. Winners greeting 20,000 Croatian fans at the new Split stadium. We invite you to enjoy very beautiful folk songs, sung by "Filip Dević" Ensemble from Split.